It's always interesting to analyse your customers. Though there is direct relation between a website's traffic and actual customers, it often throws up results that are quite different from web traffic analysis. - In many cases where women make a purchase, the men make the payments. Not sure which one is true, but I am sure this statistic has also to do with the fact that we dont do cash on delivery. 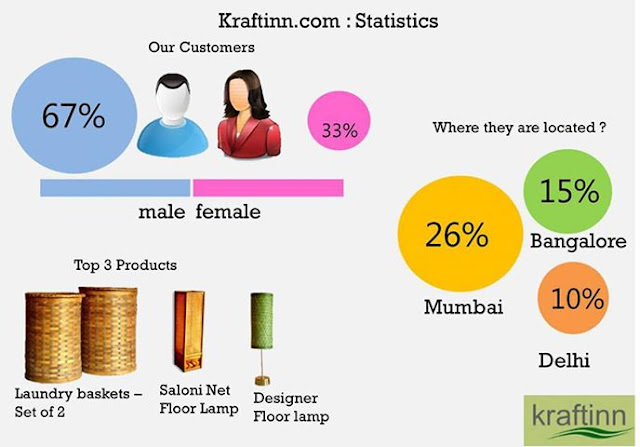 2) More than 50% of our customers are from Mumbai, Delhi and Bangalore. I guess this means people in large cities are much more comfortable purchasing online (especially if no COD is involved) and if it is a small niche website like ours. 3) Our top 3 products indicate that there is a curious mix of pricing, value, images of products that make certain products much more appealing. We have some excellent products that look great - touch and feel wise but somehow they get lost in the online world. Another observation is though people look at creative items more, it is usually the simpler items that people tend to buy. This is always fun to do that analysis and see how your customer base is behaving. The men/women stat is interesting too. Many eComm/retail websites are using data to really give customers a unique experience regarding messaging and communication. Data is helping in that area too, and many companies are starting to use AI. If you'd like, check out a recent post I wrote on the topic.